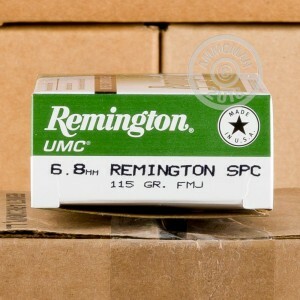 The 6.8 Remington SPC was invented as a co-op effort by the US Army and the venerable Remington. Designed to give the M-16/AR-15 platform a boost of power and energy, this round is a great option for hunting, match shooting and self defense. Remington has been around since 1816, and with a reputation like no other, they manufacture high quality ammunition and firearms. 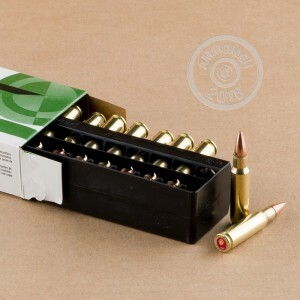 These metal cased, or full metal jacket, rounds from Remington are just the rounds you need for range training. With 115 grain projectiles, these 6.8 Remington SPC rounds are accurate and reliable. 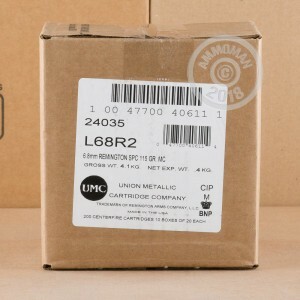 Remington loads these non-corrosive rounds into boxer primed brass cases that are re-loadable. Don't forget that all orders over $99 at AmmoMan.com will qualify for Free Shipping! Stock up and save!